PIG DESTROYER - NATASHA (DIGI) | Online Shop | Wizard LTD. Pig Destroyer brings you the story of Natasha over one, 35+ minute track of slow-motion, punishing doom more akin to early Melvins or Godflesh than the muscular grind they are known for. 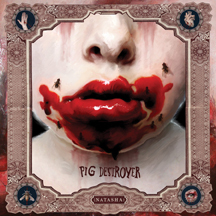 Now available as its own limited edition digipack and LP, Natasha is yet another striking chapter in the illustrious Pig Destroyer canon.